Summer is finally in full swing and what better way to celebrate than featuring the staple fruit for hot weather: watermelon. Belonging to the same family of plants as cantaloupe and squash, watermelons are in peak season during the hot summer months, when they are sweet, juicy, and flavorful. While the most common variety of watermelon we see has pink flesh, you can also get pale yellow or bright yellow varieties. The fruit can be perfectly round or oval-shaped, and there are even square-shaped melons from Zentsuji, Japan where farmers grow them in glass cases to achieve the desired shape. 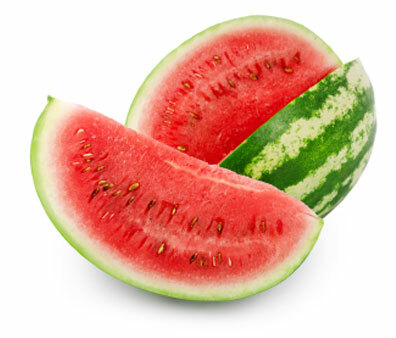 Domestically, the largest producers of watermelon are the states of California, Arizona, Florida, Georgia, and Texas. In the world of phytonutrients, watermelon wins hands-down. The juicy, watery flesh contains many beneficial antioxidants such as lycopene (the same kind found in tomatoes), which is strongly protective against cancers. It is also a good source of Vitamins C and A, both well-known antioxidants in their own right. Interestingly, a 2006 study in the Journal of Agricultural and Food Chemistry found that watermelon that have been stored for two weeks have higher levels of lycopene and beta-carotene than freshly harvested fruit, which supports the suggestion to consume fruits when they are at their ripest. The often-overlooked part of the watermelon, their seeds, have actually been found to be high in protein and beneficial unsaturated fats. In fact, a 2011 study of Iranian patients with dyslipidemia found that daily intake of powdered watermelon seeds had a favorable effect on blood cholesterol after six weeks. To choose a good watermelon, look for a whole fruit that is heavy for its size with no bruising or soft spots. The rind should be smooth and one end of the melon should have a distinctly different color from the rest of the rind: this is the spot where the fruit was resting on the ground during ripening. If the fruit lacks this marking, it may have been harvested prematurely and therefore will not be at its optimum flavor. Toast watermelon seeds (coated in olive oil and a sprinkle of sea salt) in a 325F oven for 10 to 15 minutes. Sprinkle over salad or cereal.